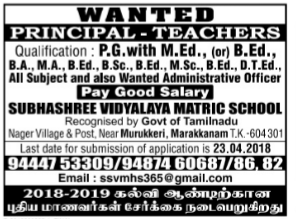 Subhashree Vidyalaya Matric School, Marakkanam has advertised in THE DINAMALAR newspaper for recruitment of Principal/Teachers jobs vacancies. Interested and eligible job aspirants are requested to apply within 23rd April 2018. Check out further more details below. Name of the School: Subhashree Vidyalaya School, Marakkanam. About School: Subhashree Vidyalaya Matric School, is located in Marakkanam taluk.it is a co educational school. Job Location: Marakkanam t.k, Villupuram Dt. How to Apply: Interested and eligible candidates are requested to send their Resume to given mail id. Last Date: For submission of application is 23.04.2018.